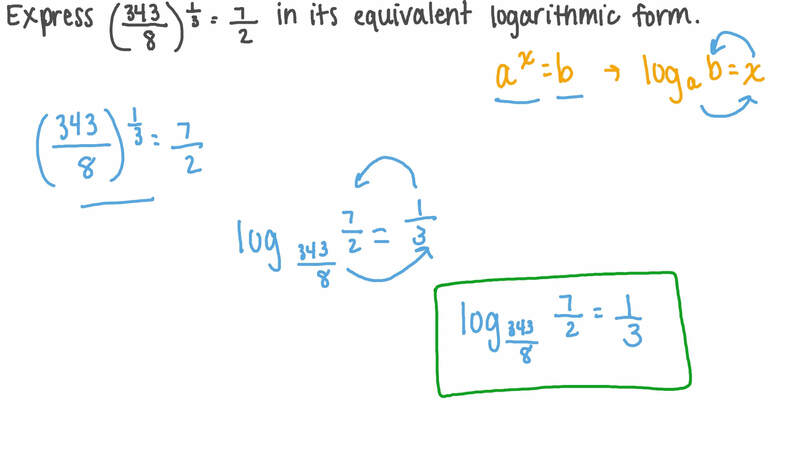 In this lesson, we will learn how to utilize the relationship between logarithms and exponentials to convert an exponential expression to its logarithmic form. 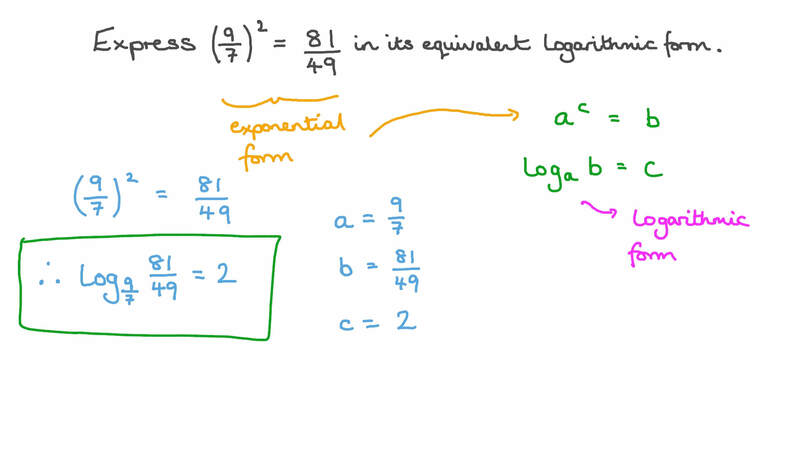 Express 4 = 1 0 in logarithmic form. Express  9 7  = 8 1 4 9 2 in its equivalent logarithmic form. Express  3 4 3 8  = 7 2 1 3 in its equivalent logarithmic form. Express 2 4 3 = 3 1 5 in its equivalent logarithmic form. Express 4 = 1 1 6 − 2 in its equivalent logarithmic form. Express ( 0 . 7 ) = 0 . 3 4 3 3 in its equivalent logarithmic form. Express ( 0 . 1 6 ) = 0 . 4 1 2 in its equivalent logarithmic form. Express 2 = 4 √ 2 5 2 in its equivalent logarithmic form. Express 1 0 = 1 0 0 0 3 in its equivalent logarithmic form. Express 2 = 1 1 6 √ 2 − 9 2 in its equivalent logarithmic form. Express  √ 2  = 5 1 2 1 8 in its equivalent logarithmic form. Solve for 𝑥 2 = 3 :        . Given that 2 − 6 = 1 0 4 𝑥 , find the value of 𝑥 . The value of an antique painting increases every year. The painting is currently worth $ 1 2 0 0 0 , and it is expected to be worth $ 2 0 0 0 0 in 8 years’ time. Write an equation that can be used to find 𝑟 , the rate at which its value increases. Solve for 𝑥 2 = 1 2 : 𝑥 + 5 . The population of a rare orchid declines by 𝑟 % every year. There are currently only 99 of these orchids left, and conservationists predict that only 50 will be left in 5 years. Write an equation that can be used to find 𝑟 , the rate of decline. Solve  1 8  = 6 4 𝑥 . Find the solution set of l o g l o g 2 2 𝑥 𝑦 = 5 − 4 and l o g l o g 2 1 0 2 𝑦 = 1 0 − 1 in ℝ × ℝ . Given that 4 = 3 𝑥 and 3 = 6 4 𝑦 , determine the value of 𝑥 𝑦 . Find the solution set of 9 = 1 7 2 9 𝑥 − 4 0 𝑥 2 in ℝ . Given that  7 6  × 𝑥 =  7 6  2 8 3 5 , find 𝑥 . Which of the following satisfies the equation 6 × 6 × 3 × 3 × 3 × 3 = 9 × 𝑥 ? Determine the solution set of the equations 𝑥 = 7 𝑥 + 6 𝑦 and l o g 𝑥 2 7 = 𝑦 , given that it is a subset of ℝ × ℝ . Given that 𝑓 ( 𝑥 ) = 2 𝑥 , determine the solution set of 𝑓 ( 𝑥 ) − 2 4 𝑓  𝑥 2  = − 1 2 8 . Find the solution set of l o g l o g l o g l o g 2 2 2 2 𝑥 + 𝑦 + 3 2 = 5 + 4 8 and 𝑥 + 𝑦 = 1 4 in ℝ × ℝ .